With December’s chill enveloping northern Portugal’s Douro Valley, the searing heat of summer is a faded memory. The dark grapes, hanging heavy on the vines that terrace down the mountains to the river, have been picked and crushed, their fermented juice placed in huge oak casks to spend the winter. 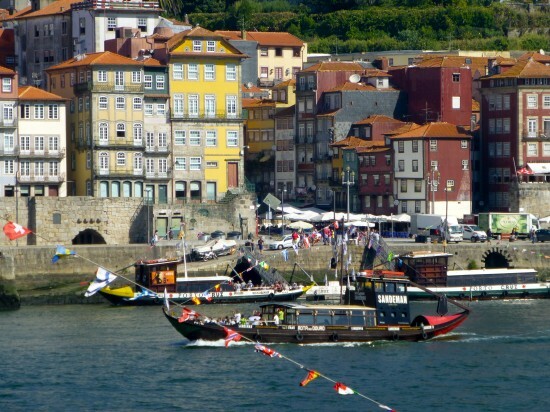 Come spring, the wine will be transported to the river’s mouth for aging in the lodges of Vila Nova de Gaia, where the moist marine air creates the perfect conditions for port-making. 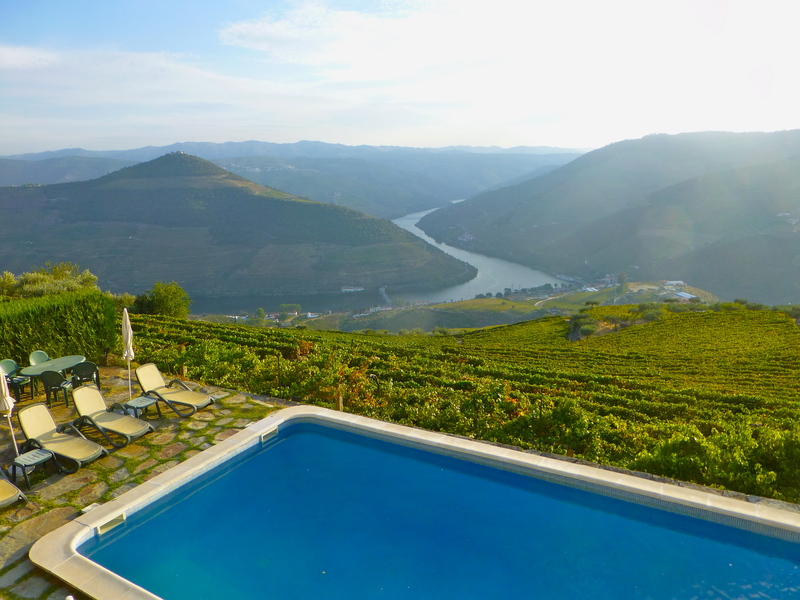 It’s the quiet season in the Douro now, but just weeks ago I was paddling Portugal’s River of Wine in the autumn sunshine at harvest time. Our small group of nine was part of a unique Natural Habitat Expeditions trip that combines active pursuits like kayaking and hiking with a cultural immersion in a vestige of Old World Europe. In a region where international travelers are few, we stayed at historic quintas—the traditonal family-run wine estates of the Douro Valley. We quickly learned why our guides dubbed this trip “float and bloat”—though we paddled about four hours each day, we were hard-pressed to avoid weight gain as we gorged on hearty, homecooked meals, from salted cod in cream to roast lamb to feijoada, a rich pork and bean stew. Main dishes were accented with locally grown complements, from green olives and artisan sheep’s cheese to fresh-picked oranges and figs, and crusty bread with spiced peach preserves. 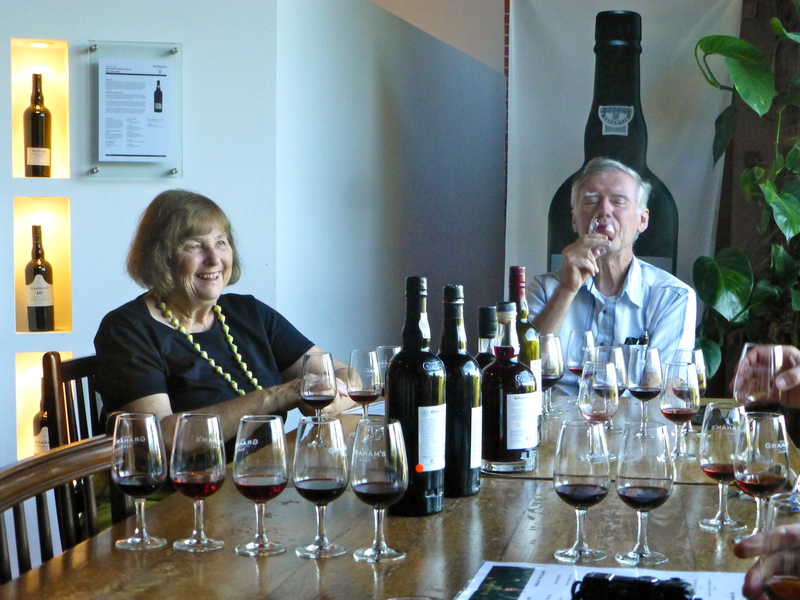 Each course was accompanied by a sampling of local wines – reds, whites, and of course ports. 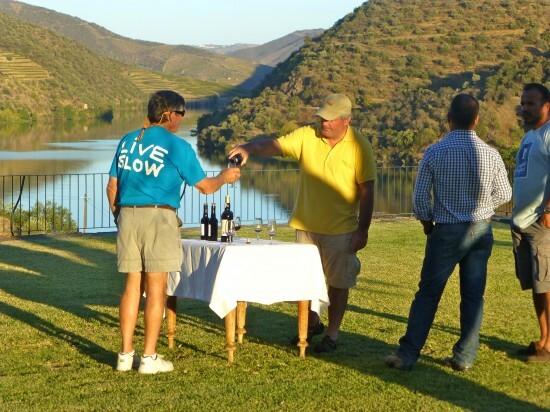 For nearly 2,000 years wine has been produced in these arid mountains, bisected by the river that connects the region to the sea. The first port made its way to the coast in the mid-17th century by rabela – the classic wooden boat that carried the barrels through the Douro’s rugged canyons – where it was fortified with brandy to preserve it for the journey by ship across the Atlantic to Britain. 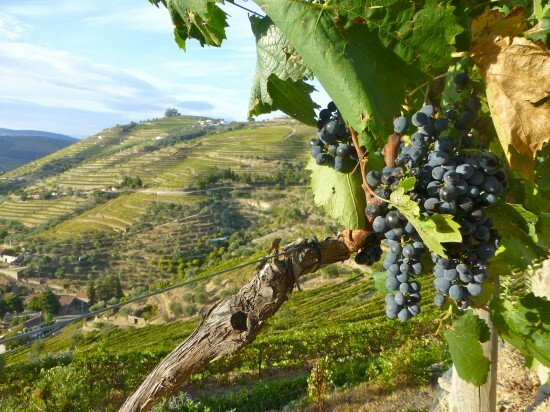 The Alto Douro demarcated region within which all authentic port production occurs is the oldest regulated wine-producing area in the world, established in 1756 and designated a UNESCO World Heritage Site in 2001. Today this same rocky schist and hot, dry micro-climate produce as much table wine as port, with more than 100 different varieties of grapes grown on the stacked granite terraces. But wine is not the Douro’s only draw. Upriver are hardy olive and almond orchards, and beyond them, wild country on the Spanish border where wolves still roam and raptors glide. This is where our river journey began, about 100 miles inland from Porto in Douro International Natural Park. 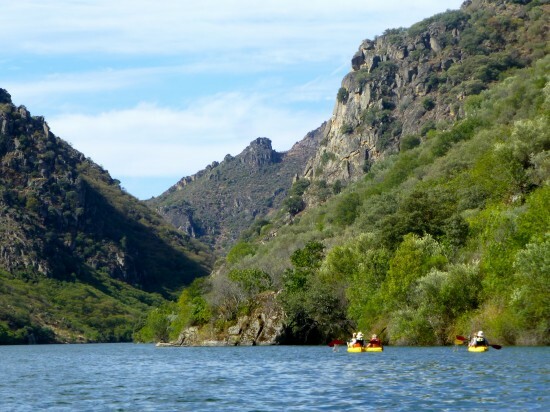 It’s a region of green plateaus and rugged gorges, favored by a host of endangered birds that covet the wide-open landscape where the only sounds are the whisper of wind and the drip of our paddles. Signs of civilization were initially few as we paddled downstream, wedged between steep canyon walls with Portugal on one side and Spain on the other. The Douro was a ribbon of glass, its surface rippled occasionally by ospreys or herons in the marsh grasses near shore. Dams built in the 1960s and ‘70s have eliminated most of its current, making kayaking easy, even for beginners. We quickly got into a comfortable rhythm, settling in to the mellow pace that would mark our days on the water. Picnic lunches ashore in the shade of eucalyptus and quince trees laden with heavy yellow fruit preceded lavish dinners at the quintas. 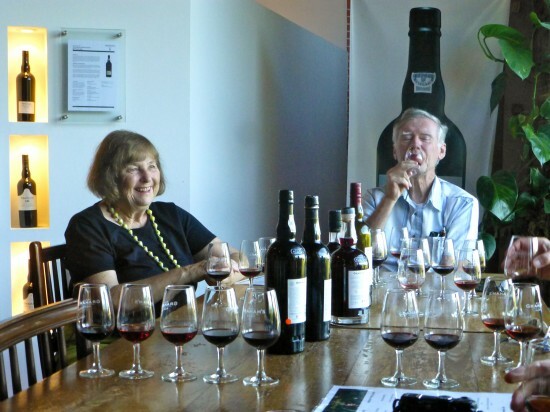 Each quinta was distinctive, from the rustic organic farmstead of Barracão da Vilariça to the refined elegance of Quinta dos Malvedos, the flagship vineyard of the Graham’s label. Here, we sipped white port tonics on the manicured lawn in front of the stately manor house before heading in to the dining room for a sumptuous lunch accompanied by a selection of ruby, tawny and vintage ports. 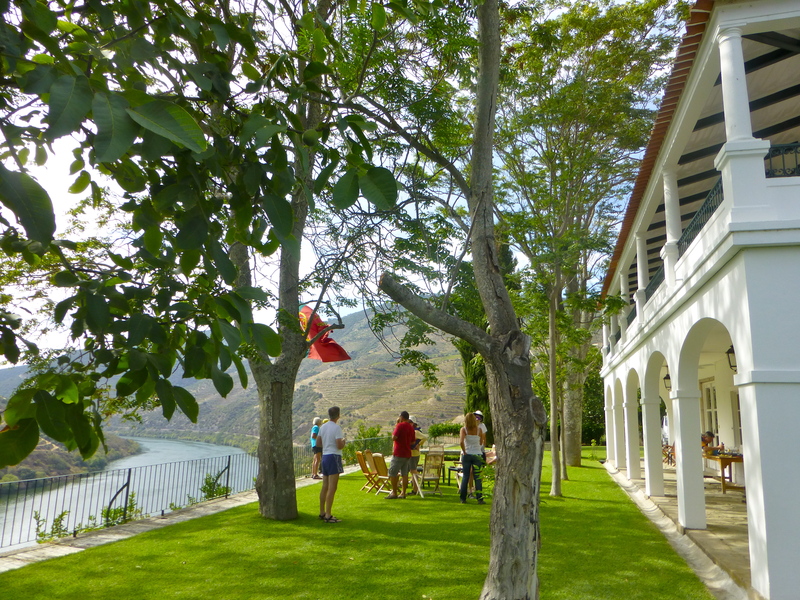 It was all we could do to rise from the table to tour the winery, yet somehow we managed another feast that evening at Casa de Casal de Loivos, even higher in the vine-covered hills. A BBC travel film crew dubbed the view from this 18th-century quinta one of the six best in the world, and we were quick to concur as we surveyed the panorama from terrace, the silvery-blue river wending its way between rolling mountains dotted with the red tile roofs of scattered villages. After six days and some 60 miles on the river, our paddling idyll drew to a close as we returned to the lovely old city of Porto where the Douro meets the Atlantic. Across the river, port has aged in the lodges of Vila Nova de Gaia for nearly 400 years—the final stage in the winemaking process. Each lodge welcomes visitors for tours and tastings, a perfect prelude to dinner on the Ribeira, Porto’s historic waterfront promenade. Paddling Portugal’s River of Wine is an exclusive opportunity available only through Natural Habitat Expeditions. 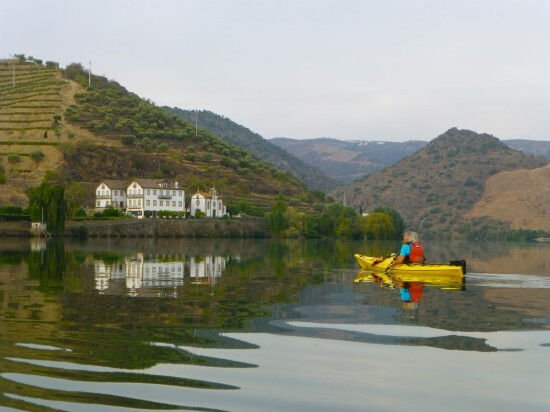 Other than a handful of small river cruise ships and daily sightseeing boats from Pinhao, access to the Douro is limited, and nothing offers as intimate a vantage point as the seat of a kayak. As they say in Portugal, a sua saude — to your health! P.S. You will also enjoy trip member Jo Ann Creore’s account—with wonderful photos—of her trip down the Douro with Nat Hab Expeditions—find it here on her blog.